It’s been a little quiet round these here parts. I mean the blog, not Israel. Below, I explain a little as to why this has been the case. This isn’t really my normal blogging style, it’s just a chance to vent a little, so feel free to skip this one if you so desire. I promise to not be offended. To say that the last few months have been an education is somewhat of an understatement. Almost ten months since I stopped working in London, I seem to still be some way off from getting my paramedic qualification recognised here. The key word, as you may have gathered either from previous posts or from twitter, is bureaucracy. Even prior to our arrival, I’d made contact with the right people, presented documents, certificates, qualifications and all manner of related material, and was promptly promised that after a short conversion course of sorts, that I’d be a fully qualified paramedic. There are, like many other places around the world, many roles for a paramedic in Israel, within multiple different organisations and healthcare providers. However, the issue of paramedic qualification belongs to only one – the original (and still main) Israeli ambulance service – Magen David Adom (MDA) – a subsidiary of the International Red Cross. As an organisation, MDA has a pretty good reputation around the world. Many an ambulance service has come to study its mass-casualty treatment system and they lead the way in some of the treatments they provide. Yet at the same time, I'm discovering that it is overly burdened with tape the same colour as its well-known emblem. And I thought that London was bad. I’m a little wary of accusing anyone of lying, but I think that the phrase “terminological inexactitudes” is a fair one. The information I provided wasn’t passed on. Claims (false or misinformed remains to be determined) were made that they had never had a paramedic who had qualified overseas want to move here, nor that there was even a protocol in place for such an eventuality. The relevant authorities weren’t informed. When they were eventually informed, there was another delay when the head of the right department seemed to leave under something of a cloud. Nothing to do with me, I hasten to add. Then the plan changed a little and was to become a two-pronged attack on the system. Whilst I was waiting for the right courses and exams to come up that would eventually give me my paramedic license, I’d also work through the other side of the system to be recognised as an EMT and ambulance driver. Unlike the UK, not all road staff need to be able, or required, to drive the ambulances here. The idea was that the driving element should be easier and quicker to complete, the EMT certificate more of a formality, thereby giving me employment, at least as an EMT. Plans are often foiled, sometimes by man, sometimes by machine. Sometimes the two combine to make life as difficult as possible. It’s meant that whilst I’ve been able to volunteer on the ambulances, I still have no actual employment. Other jobs that I’ve gone to look at, even temporary ones, both related and unrelated in any way to the medical world, have been kiboshed by the fact that someone, somewhere would tell me that there’s no point, as the bureaucracy will be sorted within a matter of days. There are three people particularly upset by this situation. The wife and I are the obvious two. The third is our bank manager. There have been moments where I have thought about giving up altogether. That the effort I’ve been putting in and the hardship my family is enduring is just not worth the final outcome, assuming we even get there. I have sat through courses, taken exams (one of which, thanks mostly to my own stupidity, but partially to the ambiguity of multiple choice questions, I have to retake next week) and pushed on through the reams of paperwork, often feeling that it is a never-ending cycle leading me to nowhere and back again. Then I’ll look back at the last decade, think back to the hundreds of shifts both in London and the few that I have here, and remember what it’s all about. What it is that I love about this job, which is so much more than just a job. Think back to the patients where I know I made a difference, or where they made a difference to me. Think back to the simple patients who only wanted someone with whom to talk. Think back to the patients who left no mark on my life, but who years later still remembered the difference we made to theirs, and who took the time and made the effort to come back and tell us so. I know that I want to continue doing it. I know that I can’t throw it all away. I know, that if only they’d let me finally do it, that I still have so much to give. To give to my patients, to my colleagues, to myself. But for each step forwards, there seems to be at least one step back. Sometimes two. To say that it’s been frustrating is yet another one of those understatements. I have known for a very long time that Israeli bureaucracy is a menace that each person has to fight at one time or another. It’s frustrating that I have the skills and the knowledge, not to mention the experience, just sitting at home and waiting. It was frustrating during the recent war that I’d hear reports of volunteer paramedics arriving from overseas whilst I wasn’t allowed to join them despite sitting on the doorstep. I am determined to beat the system, even if that then means I become a part of the very same. Perhaps once there, I can do something to prevent the next person crazy enough to want to do the same, from having to go through this chaos. In the meantime, I’m waiting for this chaos to end, just so that I can go and face chaos of another sort altogether; one that I can hopefully do something to treat. And hopefully make my bank manager a little happier, too. Two calendars run side-by-side in Israel; one religious, one civil. It means that we celebrate New Year twice a year, just to confuse everyone, including ourselves. The change of year on the civil calendar is still marked, celebrated by many just as it is in many parts of the world, although according to a press release issued by Magen David Adom, the national ambulance service, they were called to only fifty (yes, you read that right) alcohol related incidents on New Year's Eve nationwide. The Israeli population roughly numbers around the same as London, so this is a figure that the LAS could only ever dream of; they were averaging some 400 calls per hour for the first few hours of 2013. Admittedly, not all of them were alcohol related, but I can be fairly certain that a large proportion were. The end of the civil year also brings with it various annually-published reports, one of which being the traffic fatality report. The headline is nothing less than staggering: 2012 saw the lowest road-traffic fatality rate in half a century and on top of that, the rate is down 25% on the previous year's figures and some 40% lower than 2005. The UK could only hope for such a drastic change. In fact, the figures from 2010 to 2011 actually climbed by 3%, rather than reduced. It is a truly astonishing figure, but the question has to be raised as to how this has happened. 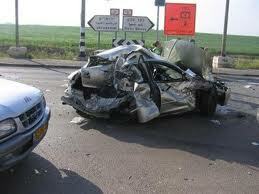 As a driver on Israel's roads, I still see the shocking driving for which Israel is infamous. Drivers see keeping a distance from the vehicle in front as a mere nicety, perhaps a minor recommendation, rather than a safety measure; lane discipline is non-existent; indicators appear to be optional extras on most vehicles and road-rage is commonplace. We live in a high-paced, high-energy, live-for-the-moment country, where allowing another driver to overtake is seen as weakness and where allowing another car to slot into your lane makes you appear like a pushover. Other figures released today show that police have issued 40% fewer tickets for driving violations in the past year, down to 600,000 from over one million. They have concentrated less on minor offences (although the report does not specify what those are) and more on notorious roads, as well as "life-threatening misdemeanors", including dangerous overtaking, running red lights or stop signs, ignoring pedestrian crossings and, in particular, drink-driving. The police can, and do, when dealing with a driver who breaks one of these so-called "life-threatening" laws, revoke a driver's licence on the spot for up to 30 days. They can also impound their vehicle for the same length of time. It all sounds like a plan is coming together. However, what the reports barely mention is the number of seriously injured. These numbers still seem to be high, and depending on which report one reads, the numbers may still be climbing. The ambulance services here are becoming increasingly skilled at managing severe trauma patients. The times taken to get to definitive care in hospital is decreasing and the treatment options increasing. Tranexamic acid, a drug commonly used in hospital for surgery associated with a high risk of bleeding, has recently been introduced to front-line crews as a pre-hospital treatment and is having, at least according to initial reports, a serious impact on survival figures. All these facts and figures are optimistic, but also leave a little confusion in their wake. Clearly, better infrastructure, more intelligent and robust policing, better skilled pre-hospital providers and the obvious ever-improving safety features of the vehicles themselves are helping to save lives. This is a trend that we can only hope will continue to improve. But the fact that the accident rate is still high, that there are still so many seriously injured, is still a cause for concern. The human element is one of the toughest to regulate. Emotion will always play a part in a driving, particularly in light of the descriptions of the Israeli driver that I have already mentioned. Actual attitudes need changing too, but that is hard to do when confronted with a seasoned driver who has years of driving experience and picking up of bad habits. Change needs to begin from the ground up, even before a 17-year-old is allowed to start to hold a steering wheel in their hand. It needs to start with the basics, for example teaching that riding a motorbike whilst wearing almost no protective gear is a path to almost certain disaster. Attitudes to alcohol need to change. No more the thought process of one drink will be ok. You want to drive? Don't drink. Attitudes to other drivers need to change. Understanding that allowing one driver in ahead of you will not only benefit them, but will help the roads run smoother and reduce the aggression on the roads. Attitudes to seat belts and appropriate child restraints must change too. Particularly in certain sectors of society. It may take another generation, perhaps less, perhaps more, but if we want to reduce fatalities even further, we need the drivers themselves to cooperate. To understand that sometimes there really is a greater, even if unseen, good. "Don't just be right, be smart." A combination of the two would be even better.